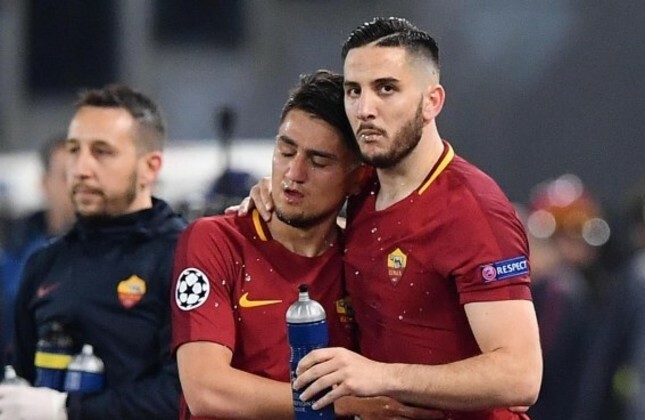 Roma's Kostas Manolas (R) celebrates with teammate Cengiz Ünder after scoring the key third goal during the UEFA Champions League quarter final second leg match at the Olimpico Stadium in Rome. While Roma has its sights on Kiev and the Champions League final after completing a miracle comeback against Barcelona on Tuesday, the Italian team's Turkish star, Cengiz Ünder, continued to shine. Roma lost against Barcelona 4-1 in the first leg match in which Ünder could not play due to injury. However, Roma overhauled a three-goal first-leg deficit, taking its place in the competition's last four after Ünder came off the bench in the 73th minute and made the assist of a third goal against Barcelona in the 82nd minutes of the match. Ünder now is aiming to be the youngest Turkish player in a Champions League final. If Roma advances to the Champions League final, Ünder will be the fifth Turkish player playing in the final. If Roma wins the Champions League, Ünder will be the first Turkish player to raise the trophy. Yıldıray Baştürk, who played against Real Madrid with the Bayern Leverkusen team in the 2001-2002 Champions League final, became the first Turkish player in the Europe's most prestigious football tournament. The other Turkish footballer to play in the Champions League final was Hamit Altıntop. His team Bayern Munich lost against Inter in the 2010 final. Nuri Şahin and İlkay Gündoğan played for Borussia Dortmund against Bayern Munich in the 2013 Champions League final. While Dortmund lost the match 2-1, Gündoğan became the first Turkish footballer to score in a Champs League final. Arda Turan missed the chance to play in the Champions League final in 2014 due to injury. Turan's team Atletico Madrid lost 4-1. Turan did not play in a Champions League final while on the Barcelona squad.